Planting tomato and cucumber together can be done, but you will need to take some extra precautions. Both plants are heavy feeders, so you will need to stay on top of making sure they get all the nutrition and water they need. Both plants also need full sun, as well as supports for their vines as they grow. Your best bet will be to build a trellis that can support both plants well. This will keep them healthy and happy, and it will save you the trouble of endless bending over at harvest time. Decide how many tomato and cucumber plants you wish to plant together. This will determine how big your trellis should be. Tomato plants should be 10 to 12 inches apart. Cucumbers can be slightly closer together. Use a pencil to measure where to cut the 2x4s. 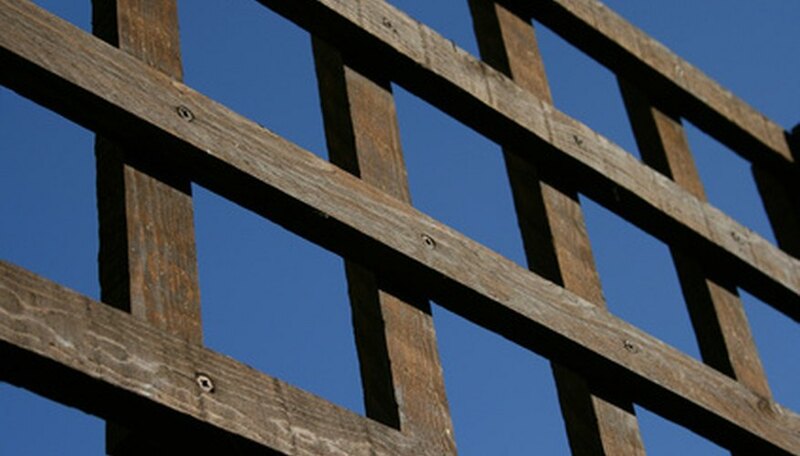 Create a simple square grid trellis that will accommodate the number of plants you will be growing. Space vertical and horizontal 2x4s evenly. All should be the same length, which makes it simpler. Nail the frame together using four 2x4s. Then nail on the vertical supports, followed by the horizontal supports. Leave 6 inches at the bottom of each of the vertical supports. You will drive these into the ground later. Prepare the garden bed for the seeds. Dig in compost. Dig in fertilizer according to the manufacturer’s instructions. Make sure to choose a fertilizer meant for vegetable plants. Plant the tomato and cucumber seeds. Sow a few tomato and cucumber seeds in each hole you make. Space holes about 10 to 12 inches apart for tomatoes, and 8 to 10 inches apart for cucumbers. Cover with soil to a depth of 1/4 of an inch. Drive the trellis into the ground. Have a friend hold it steady while you use the mallet to pound each of the supports into the ground. Do this carefully. Water tomatoes and cucumbers regularly as they grow. When they are big enough, tie the vines to the trellis using the discarded pantyhose. Twine can damage tender stems, while pantyhose is very gentle. Prune tomatoes and cucumbers to train them in a more vertical direction and to promote vigorous fruiting. Trim away any slight stems to concentrate the plant's growth into the stronger stems. Fertilize once or twice more during the growing season. Always follow the fertilizer manufacturer's instructions regarding feeding. Different types and manufacturers of fertilizer will differ in their instructions.